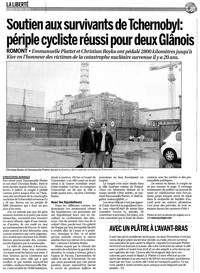 Here you will find articles that actually showed up in the newspapers radio and on tv about our cycling camping trip for the survivors of the chernobyl accident. 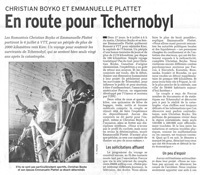 "Soutien aux survivants de Tchernobyl: périple cycliste réussi pour deux glanois"
"Couple Raises Awareness On Chernobyl Accident"
Plattet, also 31, will cycle over 2,100 km (1,300 miles) from Friburg, Switzerland, to Kyiv, Ukraine to raise awareness about.. read more..
Radio Fribourg will be following us every week of our trip with a live interview from our position at the time of broadcast. 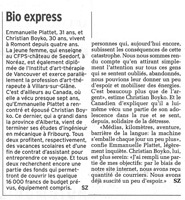 Be sure to check out our time schedule and catch us live on the radio via the internet, compliments of the buttons below. 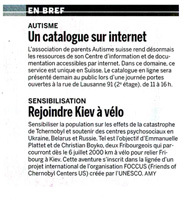 The broadcast will be in French and the times are local to the Bern Switzerland time zone.We would like to thank Radio Fribourg and Olivier Léchaire for their participation in our journey to raise awareness for the survivors of the Chernobyl technological accident. 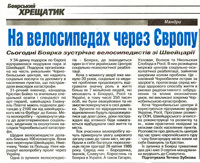 The weekly updates will be kicked off with an interview on July 5 2006 only one day before the actual trek begins.